In Gun Games, the sensational Faye Kellerman once again showcases Peter Decker of the LAPD and Rina Lazarus, arguably the most popular husband and wife team in contemporary crime fiction. A rash of shocking adolescent suicides at an elite Los Angeles private school is at the heart of this gripping thriller that also focuses on the troubled teen Decker and Lazarus have brought into their home: Gabriel Whitman, the son of a psychopath. 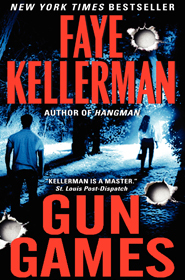 Herself one-half of one of noir fiction’s true “power couples”—along with her husband, acclaimed mystery writer Jonathan Kellerman—Faye Kellerman once again demonstrates how American police procedural writing is done to perfection with Gun Games.